This is a simple Bingo type game. First choose the bet amount by clicking on the + and - buttons in the lower left corner of the screen. Then review the Bingo card just above the betting buttons. If you want a new card, click New Card . When you have a card that you like, click Start . The machine starts to draw balls. 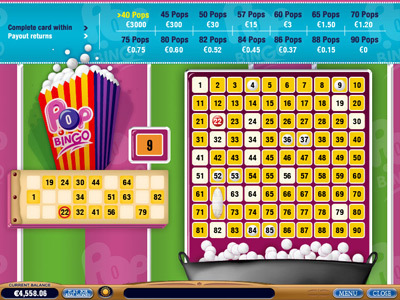 The number of balls drawn is displayed above the bingo card. You win according to the number of balls required to fill your card. The winning table (Number of balls - winning amount) is displayed on the higher edge of the screen. First choose the bet amount by clicking on the + and - buttons in the lower left corner of the screen. Then review the Bingo card just above the betting buttons. If you want a new card, click New Card . When you have a card that you like, click Start . The machine starts to draw balls. The number of balls drawn is displayed above the bingo card. You win according to the number of balls required to fill your card. The winning table (Number of balls - winning amount) is displayed on the higher edge of the screen.